We are committed to carrying out low-cost, high-impact community projects to help impoverished communities directly and efficiently, with respect and an understanding of their needs and concerns. Over the past 50 years, we have identified, planned and delivered projects across all countries in which we operate. KK Security maximizes its Corporate Social Responsibility (CSR) impact by making every dollar count through close liaison with its beneficiaries, allowing them to communicate what they really need, not just providing what we believe they need. With its Golden Circle Membership, KK Security in Rwanda supports various projects to promote Youth Entrepreneurship Programs. In 2016, we also supported Kigali International Community School in its program to assist vulnerable Rwandans in getting access to school materials and learning books. In 2017, we will be joining the Rotary Program for providing Free Access to Medical Insurance to vulnerable Rwandans. In order to improve maternal and child health outcomes in the country, the First Lady of Kenya, Margaret Kenyatta, launched the “Beyond Zero Campaign” on January 24 in Kenya’s capital Nairobi. Fifteen women die every day due to pregnancy-related complications in Kenya and 20% of all deaths among mothers in the country are AIDS-related. KK Security pledged money in support of the 2016 event to purchase mobile clinics that will provide integrated HIV, maternal and child health outreach services in the country. 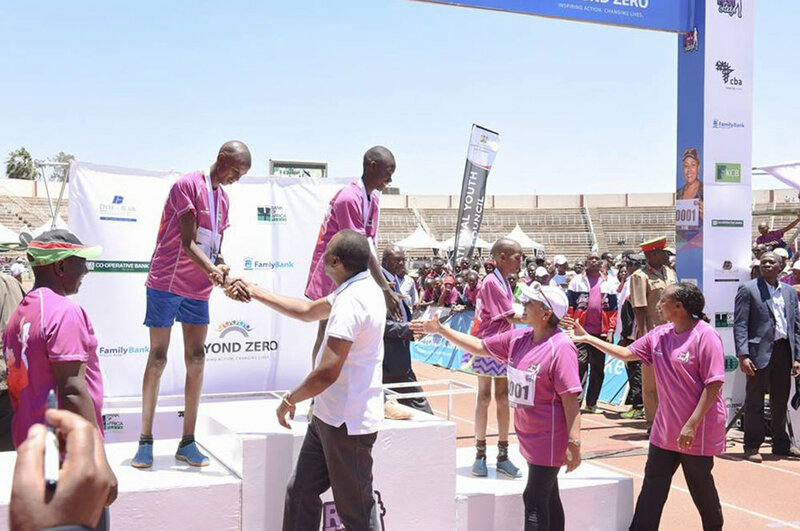 The Beyond Zero marathon series is aimed at creating awareness and mobilising resources. The Kenya Marathon had a record audience of 70,000 men and women, up from 50,000 participants in 2016. Each year, we sponsor and participate in the annual Kilimanjaro Marathon held in Moshi/Arusha. In 2017, the 42-kilometre race had over 520 complete the courses. The race is a great opportunity for local running talent to meet, and it draws quality runners from neighbouring countries and from around the world, with runners from up to 40 nationalities attending the event. Apart from the sports element, the event benefits the region with sponsors building their CSR around the event, and the economic benefits to the country are huge. The event has also influenced a change in lifestyle across the country, with many more people taking up running to keep healthy and socialise. Every true Tanzanian wants to participate in the “Kili” as it is known, and the medals are worn with pride from Tunduma to Taveta. The Joy Valley Children’s home is located in Dagoretti, Nairobi, Kenya. The home currently cares for 75 children on a full-time, residential basis and 65 on an outreach basis. KK Security was pleased to pledge an annual donation of Kshs 110,000.00 in February 2017. The home provides shelter and a basic level of primary and secondary education to orphaned children. The home is at maximum capacity and they struggle to provide enough bedding and space for the children to sleep. In addition to our annual financial donation, staff from KK Security visit the home on an ad hoc basis to donate food, clothes and bedding materials. KK Security has been a sponsor of the annual Rhino Charge in Kenya since 2005. The Rhino Charge is an off-road 4×4 competition where entrants are required to visit 13 points (guard posts) scattered over approximately 100 square kilometres of rough terrain within a 10-hour period. The night before the event, entrants are supplied with a 1:50,000 scale map of the venue, coordinates of the 13 checkpoints, and their start position. To assist in the security of this event, we supplied 44 security officers to manage access control and general event security and two cash in transit vehicles.